Here you can find a list and a general description of the various providers of VPN server and the most well-known VPN software on the market. Note that the use of VPN is legal in all countries and in all political systems as they use the service under their own responsibility. Absolutist political, dictatorial and totalitarian system try to monitor their citizens and the Internet. Here the use of VPN tunnels offers a great opportunity to protect privacy and to browse the Internet anonymously. The special features of the provider are a guarantee 30 of days nad money devolution. The payment is approved by Bitcoin. Other forms of payment are PayPal, credit card, Moneybookers, Webmoney and AfterPay. Customers are offered for Windows, Mac, Linux, Android, iOS and BlackBerry. Log files provider is limited to date, connect + separation and the bandwidth used. VyprVPN provides more than 200,000 IP addresses in 38 different countries. Supported protocols are OpenVPN, L2TP / IPSec, PPTP, Chameleon. The maximum speed is 13 to climb Mb / s in download 19 Mb / s. The encryption is done by 128 bits, 160 bits and 216 bits. Currently the versions are available for Windows, Mac, Android and iOS. We follow the time stamp and the bandwidth used. We accept payments via PayPal and credit card. Unfortunately, there is no accurate information on the number of IPs, but 53 servers in 41 different countries are in operation. Most of them are in Europe. The OpenVPN and PPTP protocols are supported. The encryption is done with 2048 bits or 128 bits. This makes it one of the most encrypted providers on our list. It is possible to test it with a limited free version, but it is very functional. The following payment methods are accepted by VPNSecure: Credit Card, PayPal, Payza, Skill, Perfect Money, Cashu, Bitcoin. Connection logs are recorded. It is currently available for Windows, Mac OS, Linux, Android and iOS. It has quiet good speed; five times the speed of the line, no ads, and the choice of more than 500 servers in 29 different countries. Taking the Premium Plus version, you can use CyberGhost in 5 terminals simultaneously and it greatly increases the anonymity. It supports all standard protocols and clients Android, Mac, iOS, Windows offers. 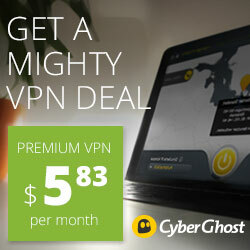 Although the free version is a bit slow, CyberGhost VPN is the version that is on the front.